Registration for this event has closed as the capacity for this event has been met. There is a waiting list for this event, and we will contact you with more information if a space becomes available. We look forward to seeing you at other future events! 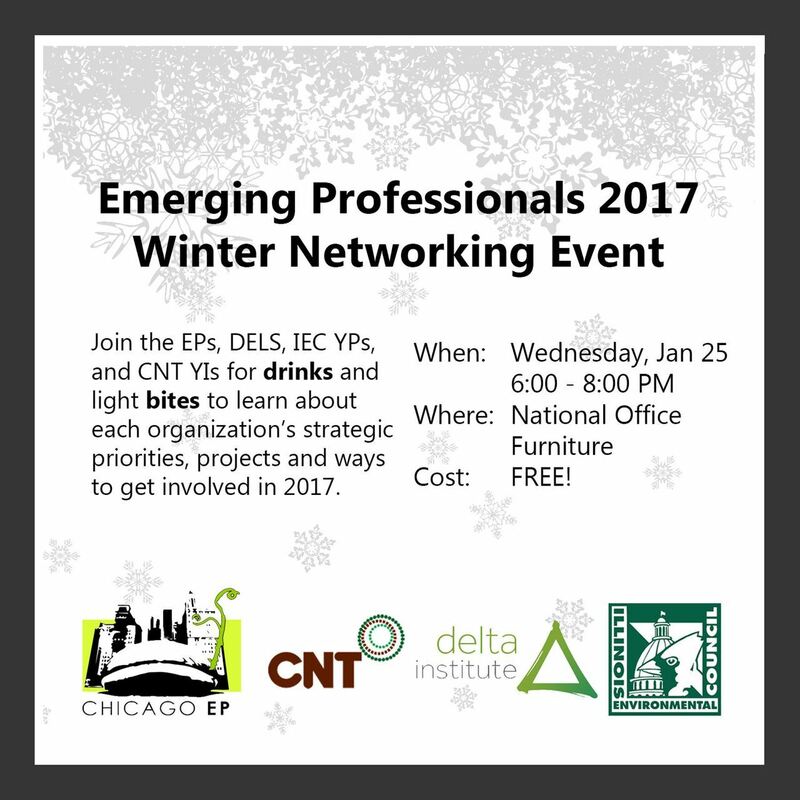 Join the USGBC Illinois Emerging Professionals, Delta Emerging Leaders, Illinois Environmental Council Young Professionals, and Center for Neighborhood Technology Young Innovators for drinks and light bites to learn about each organization’s strategic priorities, projects and ways to get involved in 2017. The Delta Emerging Leaders (DELs) work as an extension of Delta Institute to create programming that engages and empowers young leaders to advance innovation and sustainability in Chicago. The Illinois Environmental Council’s Young Professionals Board is an effort by the IEC to engage and organize Illinois’ next generation of leaders on environmental issues. Consisting of young professionals from the public, private and non-profit sectors, the YP Board raises money to support the IEC’s important work, supplements IEC’s efforts on key environmental policy initiatives and provides a forum for young professionals concerned about environmental issues to meet, greet, and interact. The CNT Young Innovators are a community of young professionals working to actively engage with new ideas about urban sustainability and resilience. The CNT Young Innovators board also hosts a variety of educational, outdoor, and social activities throughout the year.